Doberman Forum : Doberman Breed Dog Forums > Doberman Specific Chat > Doberman Health > Chloe is coughing again! I noticed her coughing on Saturday. She is going to the vet this afternoon. I'm worried....all I see on the net is DCM or heart worms. We do treat her for heart worms but I see sometimes they can contract them anyway? Help! What test should I ask for? She did get better with the antibiotics. But now the cough is back. 3/4 I took her in for a cough. They said she has kennel cough. 3-4 days later she was back to her old self. We finished the medication. 3/25 going back to the vet. Good morning BB ! Hate to hear this news . There are two things here - first - and your Vet may have did this the first time - is do a bacterial culture - then they can use the - better meds to treat it . But what I'm wondering is if Chloe got re-infected some way . Did you wash all her bedding ? deep clean and disinfect the floors ? Any where she would walk ? Bowls ? Anything she may come into contact with when she was sick the first time ? Just me thinking out loud here . I did clean but I don't think I would call it a deep clean. Oh no, did I re-infect her? I do wash her bedding and suckie toys every week...is that enough? I can't stand to hear her cough....that freaks me out! I tend to jump off the deep end. I hope its something simple. 7 days of meds. I hope its not anything major. 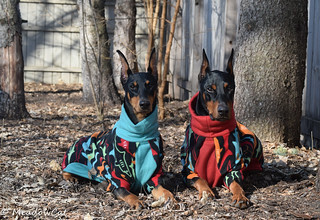 I have lost 2 dobermans at a younger age. Blueberry at 4 from something close to Lupus and Mr. Huck at 6.5 from his spine breaking down. I jump to the worst case sometimes. Chloe is 8.5 years and has been very healthy. I hate to say it, but if it were me, I'd be doing an echocardiogram. At the very least, I would have a canine cardiologist put hands on him. Even if the issue is unrelated to DCM, It could be very valuable to have a baseline echo and Holter done along with a full senior blood panel also. Vet sure its kennel cough. He says it can return especially in older dogs. However, I am looking into taking her to a cardiologist in the near future. Maybe vet will do just a simply xray ...just to see if there is a build up of excess fluid in the lungs. I'd want an EEG or an echo (I know you've already agreed upthread). With Elka we did only an X-ray first and we were still wrong. Just a couple days and what the EEG told us was too late.